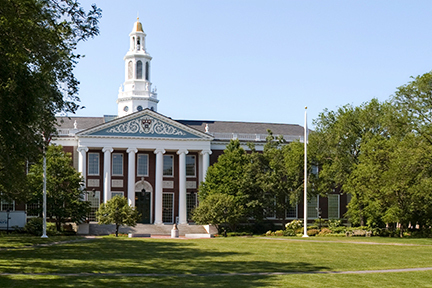 Walking through the Harvard Business School campus is an experience unlike any other. This stately, elegant 40-acre campus of classic red-brick buildings, tree-lined walkways, and open, grassy courtyards was dedicated in 1927, and is the only top business school in the country with a residential, self-contained campus. The campus design serves to strengthen the sense of community at the School, with the belief that the daily interactions of residential life only increase the potential for learning. We recognize that every student has a unique set of life circumstances and needs: some are single, some are married, some have children, some cherish their privacy and a larger living space, while others want a stronger sense of camaraderie with their fellow students. The MBA experience is more than attending classes—it's about having a sense of community, and feeling that the place where you live for two years is truly your home. That's why, students can choose from a range of on- and off-campus housing options to satisfy their needs. More than 65 percent of HBS students live on campus in dorms or apartments through HBS Housing and Harvard University Housing. For students who enjoy the convenience of being steps away from any campus activity or resource, HBS offers several on-campus options. More than one-third of students reside in five on-campus residence halls, managed by HBS Housing. These residence halls have one- and two-room singles, most of which have private baths. Dorms also feature high-speed Internet access, dry cleaning and laundry facilities, housekeeping services, and a common lounge with a large, flat-panel television and a piano! Housing in residence halls is limited to single students (for housing purposes, you are considered a single student if, regardless of your marital status, you will live alone while at HBS). Because of the very high demand for residence halls, on-campus housing is assigned through a lottery. Students who are interested in living outside the Business School campus will find the resources they need to locate an apartment or home through Harvard University Housing. Harvard University Housing: Students will find a selection of Harvard University Housing apartments, including those in Soldiers Field Park and One Western Avenue (both located on the HBS campus) and nearby 10 Akron Street and Peabody Terrace. These apartments are open to all Harvard graduate students and are popular among those with families, who are not eligible for residence halls. Harvard University Housing offers furnished, unfurnished, and pet-friendly apartments on a fixed-term lease basis and does not require a security deposit or finder's fee. Rental fees include the cost of utilities at all complexes and Internet in select locations; 24-hour maintenance service is provided. Please visit huhousing.harvard.edu for more details. Private Listing: To help you in your search, the Other Housing and Resources section of the Harvard University Housing website includes self-service, private-market apartment, room, and house rental listings; roommate listings for Harvard affiliates; and short-term sublet and bed and breakfast listings.